20 Jul 2018 – Rural residents are being poisoned in Brazil from pesticides sprayed near their homes, schools, and workplaces, Human Rights Watch said in a report released today. Many rural communities fear reprisals from wealthy and politically powerful farmers if they denounce such poisonings or advocate more protective laws and regulations. 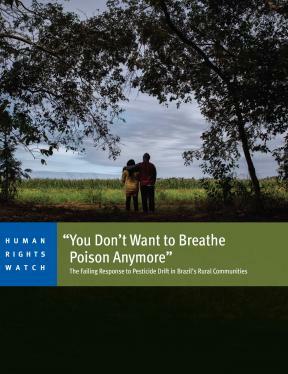 The 50-page report, “‘You Don’t Want to Breathe Poison Anymore’: The Failing Response to Pesticide Drift in Brazil’s Rural Communities,” documents cases of acute poisoning from pesticide drift in seven sites, located across Brazil, including farming communities, indigenous communities, quilombo (Afro-Brazilian) communities, and rural schools. Exposure occurs when pesticide spray drifts off target during application, or when pesticides vaporize and drift to adjacent areas in the days after spraying. Of the 10 most widely used pesticides in Brazil in 2016, four are not authorized for use in Europe, indicating how hazardous other governments consider some of them. Human Rights Watch found that people in many exposed communities fear reprisals from large landowners. Members of five of the seven rural communities Human Rights Watch visited said they had received threats or were afraid of retaliation if they reported pesticide drift that they believed poisoned them. In 2010, a farmer who was an anti-pesticide activist was shot and killed after pushing the local government to ban aerial spraying that year. Large plantation owners often ignore a national “buffer zone” regulation that prohibits aerial spraying of pesticides near housing. There is no corresponding national “buffer zone” for ground spraying. Official data on pesticide poisonings grossly understates the severity of this problem. The government’s monitoring system for pesticide residues in drinking water and food is also weak. In acute pesticide poisonings, people suffer from symptoms such as vomiting, nausea, headache, and dizziness during or immediately after nearby pesticide applications. At the same time, chronic exposure to pesticides, including to low doses, is associated with infertility, negative impacts on fetal development, cancer, and other serious health effects. Pregnant women, children, and other vulnerable people may face elevated risks. Brazil should not allow pesticide spraying from airplanes over people’s houses or from tractors beside classroom windows, Human Rights Watch said. As a matter of urgency, Brazil should impose a moratorium on aerial spraying and create a buffer zone for ground spraying near sensitive sites. Over the next few months, Brazil’s congress is to consider a bill to further weaken the regulatory framework for pesticides. A special parliamentary commission approved the bill in June 2018, and the full lower house needs to vote on it before it goes to the senate. Among its many proposals, the bill would substantially reduce the role of the Health and Environment Ministries, the agencies with expertise in the impacts of pesticide use. The bill also proposes replacing the legal term agrotóxicos (pesticides) with produtos fitosanitários (phytosanitary products), masking the health and environmental hazards of pesticides. Brazil is one of the world’s largest consumers of pesticides: annual sales are about US$10 billion. 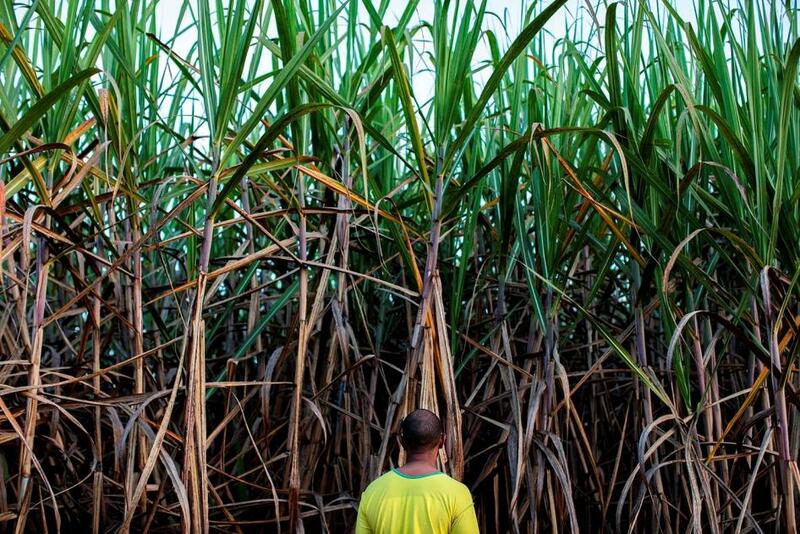 The massive amount used is driven by Brazil’s expanding large-scale, monocrop agriculture. About 80 percent are used on plantations for soybeans, corn, cotton, and sugarcane. Many of the pesticides used in Brazil are highly hazardous to human health. Of the 10 most widely used pesticides in Brazil in 2016, four are not authorized for use in Europe, indicating how hazardous other governments consider some of them. “I felt ill and with nausea and headache. I vomited a lot, once I started I couldn’t stop. I had to call my husband for help. I am pregnant, and my main concern was for my son. I was worried it might affect his health.” – Eduarda, a pregnant woman in her 20s who lives in a rural community a few hours’ drive from Santarem in Pará state. “The airplane was spraying beside the school and the wind was blowing it to the school. One couldn’t smell it but could feel the drift entering through the window. The children, between 4 and 7 years old, were complaining that their gums and eyes were burning.” – Marelaine, a woman in her 20s who is a teacher in a rural community in the south of Bahia. “I started feeling sick, nauseous. I tried to drink water to get better, but it didn’t help. I started vomiting many times, until I had thrown up all I had in my stomach and was just retching.” – Carina, an adult woman who studies at a rural school in Primavera do Leste municipality in Mato Grosso state. “One could see the white liquid [in the air]. Even smelling it, it goes to your brain. You feel a bitterness in the throat. You don’t want to breathe poison anymore – you want to breathe another type of air – but there isn’t any.” – Jakaira, a Guarani-Kaiowá man in his 40s in an indigenous community a few hours’ drive from Campo Grande in Mato Grosso do Sul state. “This week, [an airplane spraying pesticides] flew over [a neighbor’s] house with the [spray] duster on. One feels pesticides falling on the skin. Whenever there is spraying, it is like that. We have had problems with aerial spraying for around 10 years. We’ve registered several complaints at the [local civil] police station and military police. No one solves it – there is no justice.” – Bernardo, a man in his 30s from a quilombo community a few hours’ drive from Belo Horizonte, Minas Gerais state. “[Pesticide spraying] disturbs us, and it causes nausea; it gives me a headache. I try to sit on the other side of the classroom [from the side closest to where they spray]. We have a fan [in the classroom], it helps a bit, but the smell remains. I’ve felt nausea, dizziness. It’s bad because you want to vomit, but it gets trapped in the throat.” – Danilo, a 13-year-old boy and student at a rural school a few hours’ drive outside of Goiânia, the capital city of Goiás state.